Tuesday was a long day of lasts and firsts after the Last Breky of Monday and then the Last Lunch. There was the last laundry and the last email session--on a wire line at least--then the last shower and last trip to the trash. I skipped over the last bike ride, it was too cold, and went on to the last batch of cucumbers that had been pickling for a few days. The firsts included rolling up the awnings, first time since June, and driving sans clutch and playing "On The Road Again" and City Of New Orleans". Back in New Hampster, long ago and far away, there was an "Old Fahmah" among the ham radio personalities I chatted with off and on from the summit of Mount Washington. At the end of the evening he would always sign off with a remark about climbing the wooden hill. --Time to climb the wooden hill, he would say in that kind of voice that anyone who studies geographical accent distribution--there must be a word for that somewhere, one of those -ology words--would be able to place about eleven miles northwest of White River Junction. Give or take an inflection. It was like that, Tuesday was. There are some folks parked next to The Cat Drag'd Inn, where she sets at the trailhead of Weirs Hot Spring, who are from Olympia Washington, and in the course of comparing notes we discover Marci and Walter in common. I model'd for one of the hands Marci cast last year. George is asleep on the couch. He's a hitcher-hiker who was hopping up and down beside i-90 back up the road a piece, waving money and his thumb. He had a pretty thin beard and he looked about my age. He also looked like he wanted to go, someplace, real bad. At first he didn't see that I'd pulled over for him, it took me a moment to decide if I liked his beard, and after a passing trucker commented on that I gave a blast on the air horn and he hobbled on up to the door. --I'll give you twenty dollars to take me to Missoula!, he exclaimed as I got underway again. I'm goin' that way but I'll take it anyhow, I said, this old bus is very thirsty. So am I, he said, got any beer? George's storey rivals my own. I'm older by four months, to the day. But he's on a pension whilst I'm still working, sort of. Married thirty years and raised four kids but now he's not so he travels around the country. I think I may have mentioned before how the road is always longer than what it says on the chart. No matter how many extra hours I allow to get somewhere it always takes me longer. But this hot spring was worth it and I just may sit here all day tomorrow. In the course of carrying him to Missoula, where I was going anyhow in order to get to the hot springs west of Lolo Pass, we had long conversations. His friend is in gaol, his wife of thirty years left him recently for another man who then left her, his kids don't want him around, and he has a disability pension of eleven hundred dollars a month that he spends on beer and groceries for which ever friend he might be living with at the time. From moment to moment he was lucid and then forgetful. His "stuff" is scattered around the state much like mine is scattered around the country. When in the course of conversation I told him I was on my way to TeXas he allowed as how he'd like to go to someplace warm, he didn't want to spend another winter in cold Montana. Could he go to TeXas with me? It was tempting; the thought of having a companion to share expenses, so instead of setting him down at Missoula, I carried him along for a couple of days while I went over the Lolo Pass to visit the hot springs at Weir Creek and Jerry Johnson. When I was driving he sat up front and we chatted about nothings. Mostly he would retell the storeys he'd already forgotten he'd told me an hour ago. And then he would suddenly stop and talk about how he was loosing his memory and did I have any problem with my memory... We're the same age remember, three months to the day even. All I could think of was the early stages of my mother going down that same path. Between being drunk and his forgetting and the haste of it all he'd left/lost his pack and clothes at a bar in Butte a few days before when with a friend he caught a bus for the small town where I picked him up. Now that friend was in gaol for some stupid altercation with a mutual girlfriend and he, George, was hitching back to Missoula. But he could buy more clothes he assured me, he had an ATM card. As we wandered through the twists and turns of U.S.12, across the Lolo Pass, and camped at the trailhead to Weir Creek he revelled me with storeys of his hitching cross-country on freight trains, of his early days hunting and logging these very woods--his disability was from an accident that broke his back--and he had to remember one of these days to apply for his pension from the mill but wasn't sure if he did it would cut into his disability. One pension was taxable the other wasn't; one was his alone the other his former wife might get a share of, and maybe even more than a share. But he couldn't find anyone he could trust to advise him. 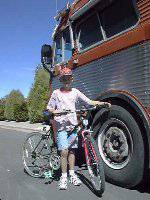 He told of his Airstream trailer that is parked somewhere and his bicycle that is somewhere else. And his hand shook as he held a glass of water. We talked more about the logistics of my carrying him all the way to Amarillo. Could he share the expenses? What would he do when he got there? Oh yes he would be quite willing to share, he reminded me he had an ATM card. All he wanted to do was get to someplace warm. Amarillo is not a warm place in the winter I told him. He'd have to go a lot further south. We looked at a map. He wanted to know what I was going to do there and how long I was going to stay and where I was going next. Could he stay with me through October? And then go on elsewhere with me? It began to look like he was really looking to be adopted for the winter and that eventuality I was less willing to contemplate. I tried to explore my own deeper feelings in this regard and found a fearful abyss. He needs family to look after him and failing that some more pecuniary and professional interest to exploit him--someone with at least more stability than me. As the miles went past and his storey went on he told of his seizures--he can't afford or doesn't want to take his epilepsy medication--and his kids, grown and married now, and rejecting him as his wife had--one is in gaol on drug charges another has lost custody of his own children, George's grandchildren, to his ex-wife of all people, for abusing them--it was all very sad. And on top of all that his ATM card had only perhaps a hundred dollars behind it until next month, until his next disability check came on the third of October. Carrying him along to Amarillo was not a problem for me, nor was the possibility that he would never pay the freight, but the thought of having to set him down in that strange city and him wanting to stay on, and the likelihood of any number of his conditions becoming something I'd have to accommodate along the Way, all conspired to lead me to suggest that he was better off in cold Montana among such friends as he had rather than being left off in cold Amarillo to fend for himself. Eventually he agreed that was the best idea and I set him down in the south of Missoula as close as I could get the bus to the narrow streets of his neighbourhood; he would walk the rest of the way and find a friend to take him in, maybe drive him to Butte to see if his pack was still at that bar. Aloud I wished him well and at the same time thought to wish my Self well. May the Force be with you old man; may the Force be with me as well. Between 28f and 34f this morning, depending on where I place the thermometer. Amazing there can be that difference within only a few feet. One thing for certain is the frost on the saddle of the Black Antelope. Ian would certainly howl if he were here to ride now. Of room on his head. A metaphor for me I think. Maybe it means I should rewrite my resume or paint the bus after all. Or not. Then there was another hitchhiker holding a sign "Bozeman", a pack at his feet, at the end of the on-ramp after a fuel stop. (The Cat Drag'd Inn by the way is averaging nine miles per gallon pulling the little truck up and down the hills of Idaho and Montana.) When I coasted up to him and opened the door he said --No thanks, I'm hitching. I can see that I said, I'm going to Bozeman. --Oh, he said, I thought this was a real bus. Well, it is a real bus, I replied, maybe a magic bus, or a wayward bus, but certainly not an imaginary bus. This guy is from Uruguay where he works for the telco. He flew into California a few weeks ago and has been hitching through that state, Nevada, and north to Seattle and now on his way to Yellowstone before flying home from Utah next week. Another person, driving a bus, gave him a ride a few days ago, was also a cook, and had been to Antarctica. Hmmm, I wonder who that was. The day has warmed enough now to let the plants out. Asparagus Fern has been whinging at the door for two days now to get out for a little sun and fresh air and the chorus of wild flowers in the window box have been strident in their demand for the real thing. Jack, and Jill, Frost have been working in the garden here, nipping at the squashes and tomatoes, steam rises from the coats of the horses and llamas. Donna tells me the little apples will make a good pie so we pick a box of them for that purpose and feed all the bruised and buggy ones to the horses. There's enough for two pies. I like making pies, except for the mess to clean up after. Back at Kaniksu I made a rhubarb pie each time the plant out in the yard had recovered enough to provide the raw material but there I had a big kitchen and the mess was not a problem as it is in the narrow galley of The Cat Drag'd Inn. Flour tends to get all over the place. At least it is not necessary to roll out banana bread, the other thing I like to bake mostly. Every time I visit Yellowstone National Park I see something I didn't see before. It is like Washington D.C. there is so much going on and so little time. Coming in through the North Gate, the original entrance to the park, my first stop was a little known feature called The Boiling River. One hundred-forty degree water issuing from one of the several thousand hot springs in the park mixes with the glacially cold water in the Gardiner River. When you sit in the right place tendrils of hot and cold sooth and startle. 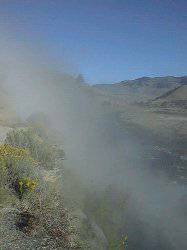 One couple soaking in the water with their heads wreathed in smoke disguised as steam allowed as how the park should be renamed Yellowstoned and a nearby dog suggested it should be called Yellowstained. An Elk on the far shore bellowed and the sun rose and changed everything. I'm camping at Bridge Bay and visiting Doug Hilborn, nature photographer of renown and also OAE Palmer which is where I met him the first time around. Doug guides tourists to all the best spots at the best times to capture on film the animals big and small and the special scenes that evoke the beauty of Yellowstone. Doug showed me some of the other side of the park. To get to Bridge Bay from the north entrance requires negotiating some of the worst roads I've ever driven. Here we are in the very first National Park and some of the roads look as tho they have not been paved since the mud was first covered with asphalt. Its hard to drive anywhere even close to the speed limit of 45 mph. That is to say that for the most part anything over 20 or 25 produces bone jarring jolts as you lurch from one chuck hole to the next while waves of nausea result from rocking and swaying through the frost heaves. No road in the North Country of New Hampshire is as bad as most of the roads of Yellowstone. One casualty of all this was the variegated spider plant. I guess she just couldn't take any more of the jouncing around and leapt out of her hanger and crashed to the deck. Her pot shattered into eleven pieces and there was soil and stones all over the rug. What a Mess! I stopped at the next wide spot and got out the super-glue. Humpty Dumpty never had it so good. 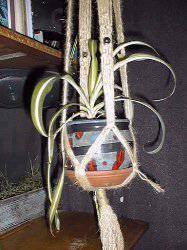 Between the glue and the electricians tape I got the pot back together and reinstalled the plant. She's a little off kilter and it was necessary to amputate several leaves but I think I got all her roots back in the pot. Only time will tell. Signs around the campgrounds and at the trail heads say all wildlife is dangerous. Do not feed your self to the wildlife! Bear and bison can easily outrun Olympic sprinters. In 1967 I was here with the first of many Scout tours in the old yellow Chevy van. It was new then, the van was. I can remember only Jacky, David, Peter, Oliver, but there are three others in one of the pictures from 1967. Two have red scarfs, one yellow. One of the reds may be Bobby. The license plate on the front of the new yellow van was AO-OA. Jacky and David are pictured with me and our Road Runner flag on the summit of Avalanche Peak. 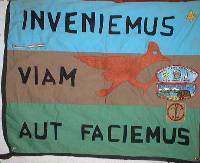 "Inveniemus Viam Aut Faciemus" it says on the flag David and Jacky hold stretched between them. So when I drove past the trailhead on the road through Sylvan Pass I stopped to walk a bit on that trail again. Not all the way to the summit this time but far enough up to have a good view of the peak. Today that flag hangs in The Cat Drag'd Inn and its admonition is still guiding my travels. In Cody there is an old hotel along the main street and I remembered we stayed there one night before we went into Yellowstone if only to experience what looked to a bunch of eastern kids like a typical cowboy hotel. We also desperately needed showers... If memory serves me right that hotel is still there but there was no easy parking for a big bus. Most of the rest of that day's drive, from Cody to Thermopolis along S.R.120, was with a following wind and although it was on average downhill the bus was near overheating all the way so I stopped often to give the engine a rest and to walk about in the rocks. The short drive turned into a long day and at the end the soak in the big mineral spring was very excellent. Sort of makes me think that a hot tub in the bus would be a good idea. This could be a nice place to roost for a while. As a result of what could be one of the few treaties between the Native American Indians and the American Government to be honoured and kept the State of Wyoming provides a public bath house at Hot Springs State Park. Certainly if it were not for this treaty you can be sure the public would take a soaking in more ways than one. The treaty between the Shoshone and Arapaho nations and the United States provides that some of the waters of the Big Spring be free to all. Well Done Wyoming! From Thermopolis to here was a lot of long interstate miles with one short sleep in a truck stop at Cheyenne. I had one rider from near Casper to Cheyenne and another, the next morning, from there to Denver. The first guy was talkative, a trucker who'd lost his license and just hanging out till he could get it back. He had a backpack and sleeping bag and camped out under a bridge when I left him off before my truckstop for the night. The other guy was scruffy, withdrawn, intent on getting to Denver. He had been hitching all the way from Montana and I'm sure I saw him along the road a day or so before. Denver is mobbed as usual. If its possible it would seem that whole developments and malls have grown up in the open fields I remember from just a few months ago. I had a good dinner with friends and chatted about the renewal of the Antarctic contract and then got chased out of the car park. The Cat Drag'd Inn was occupying eight car slots and there was not enough room for the people from the company next door to park. Next along my way was Valley View Hot Springs. The view west over the San Luis Valley from these Sangre de Christo mountains is very grand--another place worth a return visit and a longer stay. One could hike in these hills all day. To get to Valley View from Denver The Cat Drag'd up from 5000 feet MSL to 9000 over Poncha Pass. That may be a new altitude record but in any case she performed well with all the hill-climbing modifications recently installed and it helped too that the day was cool. Alamosa lies near the southern end of the San Louis Valley a cross roads town at the intersection of U.S. Highways 285 and 160. Nearest major attraction aside from the Wal-Mart and the city park is The Great Sand Dunes National Monument a few miles north. Along the way my Delorme map shows hundreds of subdivision roads that exist on the ground only as breaks in the endless barbed wire fences. Dense thickets of survey stakes with orange tape flags mark something, perhaps where trees will eventually be planted. Occasionally there is an elaborate arch or gateway with a sign indicating by means of some exotic name that your dream home will be waiting for you here before you can raise the family to live in it. Fred and Char are Ice People who live on a quiet street in an older section of this city. Char has a garden and Fred has a workshop, they share a computer and I am able to trade banana bread and Washington Merlot for tomatoes and lumber. The tomatoes will tide me over to the next Albertson's and the lumber goes into a new leveling ramp to make up for the crown of their road. Char make a fine flan and has a way with a garden that makes my spider plants perk up just being parked out front of their home on the north side of Alamosa. Not to be outdone Fred turns out an awesome omelette in between fixing malevolent malfunctions of truck and car. I put my window box of weeds out on the wall around their garden for a little sun and perhaps some lessons on how to grow. Char points out the boy across the street. He's the sort of kid who is looking for an adventure but his bike is missing a pedal and has a flat. I show him how to fix a flat and together we scrounge pedals from another bike the big dog in his back yard is guarding. Eventually he introduced me to his mother. Then we went for a ride along the Rio Grande where he showed me the deer trails and beaver dens. We had a fine morning climbing trees in the park. He is a kind, sensitive kid who cares for the welfare of the woolyworm and finds beauty in the muck and brambles along the river. Too bad kids outgrow that sense of wonder. Like some of the cousins I find in my family tree research, I'm now twice removed from where I started in Kaniksu. All the more reason to live in AridZona! Perhaps if you were a citizen of that state you could claim some sort of religious dispensation and continue to live by you own clock. That's what I do. I have a time zone line across the bus, just behind the front wheels--AZ time aft, local time forward. Presently there is two hours difference. After Halloween it will be only one hour and it will not take so long for me to get aft to the toilet. Matt and Luzma raise kids and llamas. 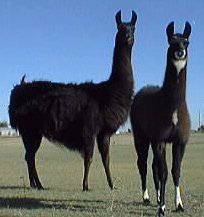 The llamas do a superb job of keeping the lawn down, they are not as messy as cows nor do they crop as close as some other animals, and they don't smell anywhere near as bad nor make all the noise of a lawn mower. Palo Duro means Hard Stick--actually a literal translation is stick, or wood, (that is) hard, but that's the grammatical difference between Spanish and English. Ask Jess to explain why. The Cat Drag'd Inn is perched precariously on her levelling blocks in Juniper (the berries of which are used in flavouring gin) Camp, site 98, one of only two spots in the camp with sewer connexion. That connectivity is one of the big expenses in building a camp so a lot of these public parks leave it out but for the Camp Host site and only have a public dump station out near the park exit. So far I have been busy settling in and breaking a lawnmower. This campground has been closed all summer due to flooding of the Prairie Dog Town Fork of the Red River early in this season. The lay of the land is somewhat on a tilt and at the low end the toilet and shower facility was under three feet of muddy water. 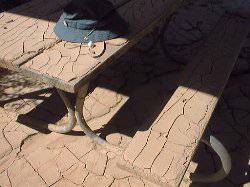 There is nearly a half inch of fine adobe mud on top of many of the picnic tables in that end of camp. So part of what I am doing here is cleaning up after; I'm good at that. The lawn mowing machine was making a lot of smoke and noise while it struggled to turn tall grass and weeds into mulch. I think it was running on oil more than petrol and I had to clean the gunk and carbon off the sparkingplug every time to start it. Then near the end of the second day of sporadic mowing there was a great BANG! and the motor coasted to a stop. I think it must have swallowed a valve or blown a hole in the piston. I've suggested that the park management might contract with Matt to board his llamas here, they have no pistons and need no petrol. These days are nice for running around and the nights are cool enough but not yet freezing. Locals say by Halloween they usually expect a hard freeze. By then I will be on my way further south.